Children’s Faith Formation (CFF) begins September 8/9 and open to those 3-years-old through 6th grade. The mission of CFF is to form young disciples of Jesus Christ, serving the mission of his Church in the world. All women of the parish: you&apos;re invited! Please join us for a wonderful evening with Mass, dinner, and a speaker on May 14. Same classes, two different tracks! These classes are open to any adult who has not received confirmation or who would like to learn more about the basics of Catholicism. We&apos;re nearly there! Over $5 million has been pledged, and our required $1.3 million to the diocese has been paid. 100% of monies given from here on out will come back to us. The OLMC priests and staff want to ensure that we are successfully leading the parish by helping each individual develop a closer relationship to Jesus Christ, build a stronger faith, and spread the Good News out into our community. Let us know how we are doing! Our participant spots for Vacation Bible School are full! However, we are still taking registrations on the waitlist. We hope to have enough volunteers so all can attend! If you are an adult or teen, please volunteer! Help make the VBS experience enriching and successful. Join us for the annual K of C Lenten Fish Dinners! Our last is April 5. The bloodmobile will also be onsite. Help save lives after you eat! Celebrate the patron saint of fathers, families, and the Universal Church with the second annual St. Joseph Day Traditional Italian Feast! On fire from the Parish Mission? Keep the flame going by joining us for the Activated Disciple Challenge! Men: If you are seeking to deepen your relationship with God and to form community with people of the parish, this renewal weekend is designed for you! Destination Jesus is February 15 - 17, and we need several volunteers to make it happen. Help our diocesan high school youth encounter Christ in the Blessed Sacrament! 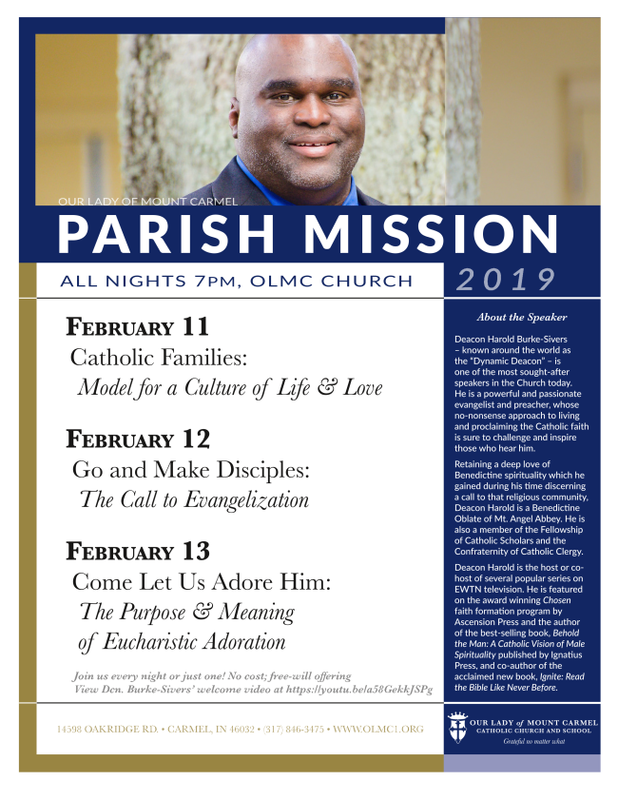 Join us February 11, 12, and/or 13 for our 2019 Parish Mission. Our presenter is Deacon Harold Burke-Sivers, known as the "Dynamic Deacon" and one of the most sought-after speakers in the Church today. Our church is moving to a new kind of church record keeping solution called Realm. Your profile enables you to track your giving, update your contact information, change family details, set notification preferences, or replace that outdated family photo. We recently worked with SportsLeader to create a video showing how they have helped transform our Sports Ministry. OLMC teamed up with SportsLeader in 2016 to bring this virtue-based programming to our coaches and players. We are so grateful for this new partnership! We are excited to reveal the project for our Dovetail Campaign! We cannot, however, begin collecting funds for our project until we have met our diocesan Fruitful Harvest goal. Our 2017 report is now online! We also have hard copies available in the narthex. OLMC parishioners will receive 2018 Fruitful Harvest Pledge Cards along with a brochure outlining our parish Dovetail Campaign the week of November 12.